The "recipe" for "prosperity" in the past decade has been to leverage more debt as incomes stagnate for 80% of the populace. That "solution" is no longer possible. At the heart of America's problems is an economic policy which is designed to keep wages down but consumption up. That necessarily means more bubbles, more debt, more wealth and income inequality, and consequently more strife and social unrest when the gravy train ends. You cannot expect to hollow out a country's manufacturing base, set up a bunch of McJobs to replace it, and still have consumers spend to support the economy. This is what we are now starting to realize. Voila. This is why the Fed and Treasury's "recipe" for "renewed prosperity"-- leveraging more debt off stagnant or declining incomes--cannot succeed. 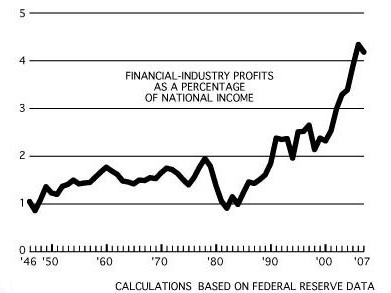 Not only are incomes flat, but consumer collateral--home equity and financial wealth-- is off a staggering $10 trillion from 2005, even as the stock market has risen 75% off its March 2009 lows and housing in some regions has bounced (temporarily) off its 2009 lows. The "trick" which worked in 2001-2003 was to drop interest rates to near-zero and eliminate any restrictions on borrowers. The policy "worked" in blowing the housing bubble, but with home equity at a pathetic 38% of real estate owned (and that includes the 30% of homes owned free and clear, without any mortgage debt at all) and financial wealth off $5 trillion, the collateral to back up renewed debt is gone. 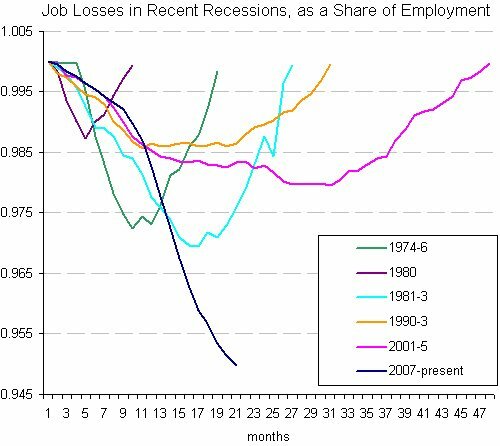 It's not the loss of factory jobs per se which has hollowed out the nation's manufacturing base--it's the loss of entire ecologies of production. Most factories in advanced economies are filled with robots, not thousands of humans; that's the only way it makes financial sense in a global economy. But some company manufactures the robots, and someone has to maintain them and program them, and other firms supply parts, software, machine tools, etc. The end-product factory is merely the most visible part of a complex web of suppliers, toolmakers, and expertise. So when a production capacity leaves the country, it's not like certain trees got logged--it's like an entire ecology has been clearcut, leaving barren hardpan behind. It becomes very difficult to recreate that complex ecology and expertise. There are many reasons why manufacturing has left the U.S., and wage arbitrage (labor is cheaper elsewhere) is certainly one reason. But we would be terribly remiss not to look at the perverse incentives built into the tax and regulatory structure of the U.S.--a system which punishes savers and rewards financial speculators, a system which puts roadblocks up to any production of real goods while encouraging government and healthcare as "growth industries," as if government and healthcare are not in effect taxes on productive capital and labor. So U.S. global corporations aren't too worried about the decline in Americans' wages; they've been shifting their labor forces and sales overseas for decades. 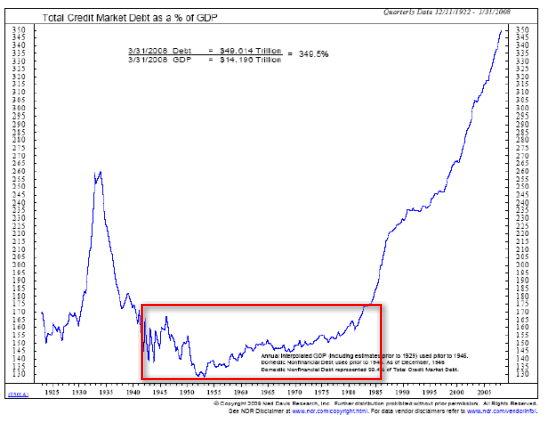 As long as the debt serfs keep taking on more debt and making the payments on past debt, then profits will remain high and the stock market--the Elites' chosen proxy for the U.S. economy--can keep rising, too, "proving" the U.S. economy is doing splendidly. As I showed in Why We Keep Getting Poorer: High-Cost Housing (February 4, 2010) , median household income disguises the reality that the majority of income increases have been concentrated in the top 5% of households. 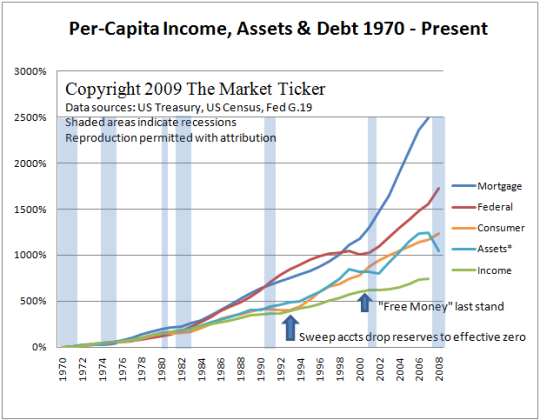 So if "prosperity" required ever-larger debt, and income and assets are falling, then what will support new debt? Nothing. No wonder the Federal government is borrowing and spending $1.5 trillion a year--80% of the populace is tapped out and can't borrow any more, and the prospects of their incomes and assets rising are bleak. Thank you, Keith M. ($5/mo), for your extremely generous voluntary subscription to the site. I am greatly honored by your support and readership. Thank you, Susannah W. ($50), for your outstandingly generous donation (in response to my 2/21 rant) to the site. I am greatly honored by your support.